Actor Ranbir Kapoor and director Imtiaz Ali visited Delhi’s famous Hazrat Nizamuddin Dargah on Monday to seek blessings of the musical saints for their upcoming film ‘Rockstar’ produced by Shree Ashtavinayak Cine Vision Ltd and Eros International. The duo was accompanied by Mohit Chauhan, who is the 'voice of Jordan' (Ranbir's character) in the film. The Dargah, that is believed to be the originating source of qawwali, holds a very special place for the ‘Rockstar’ team. 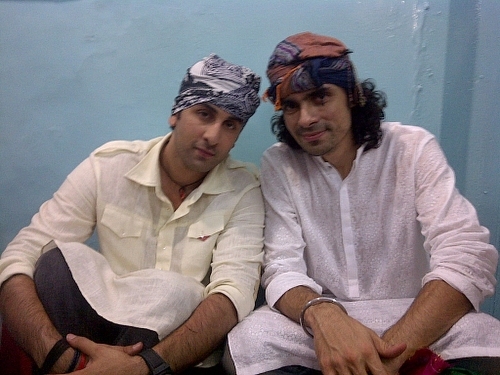 Director Imtiaz Ali often frequented the Nizamuddin Dargah during the shooting of the film that stars Ranbir Kapoor and Nargis Fakhri. Ranbir too, stayed there for a couple of days while shooting for the qawwali scene in the film that features the Dargah. AR Rahman (the film’s music director) too, has often expressed his reverence for the place. Arriving around 9pm, the team first offered the special ‘chaadar’ at the tomb of Amir Khusro, a noted musician, scholar & poet, also known to be the ‘father of qawwali’. They then proceeded to join the famous Qawwals of the Dargah to celebrate the conclusion of the highly popular 4 day ‘Urs of Hazrat Amir Khusro’ that is held every year. Ranbir Kapoor and Mohit Chauhan also performed on ‘Kun Faaya Kun’ – a qawwali from the film. While Ranbir played the guitar by himself, Mohit sung the soulful number in his voice. After an enchanting qawwali session that went on for about an hour, the ‘Rockstar’ team proceeded to interact with the media gathered at the venue. ‘Rockstar’ is one of the most highly anticipated movies this year and has already generated a lot of buzz. After two back-to-back hits, Director Imtiaz Ali is back with yet another love story set in a musical backdrop.